Bass fishing… What can you say? Fishing for bass is one of the most exciting and challenging species of fish to catch. I have fished for bass for years trying various lures and baits both on and off the ice. 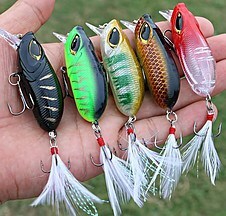 I have come up with a list of the top 10 bass fishing lures that assist me in catching their attention. Bass love lures that come at them from various angles, and you never know which angle they will strike on until you have cast your line for a hundred times. Then all of a sudden they will bite, and the struggle for dominance is on! Bass like to hide and they can be tricky to catch. It’s a lot easier to find these fighters in the summer than it is in the winter because in the summer they are more aggressive and hungry. In the winter like most species of fish their metabolism slows down, and they slow down and are not as hungry. They still need to feed in the winter months, but it becomes more of a challenge catching them. The following is a list of the top 10 lures I keep in my tackle box permanently when fishing for bass. 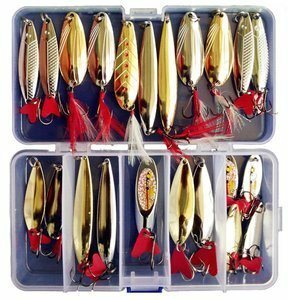 The ten lures in this list are the lures I use to catch bass. Some of them can be useful in both hard water and open water fishing. These lures are in no particular order of effectiveness. The first one on the list is the good old casting jig. 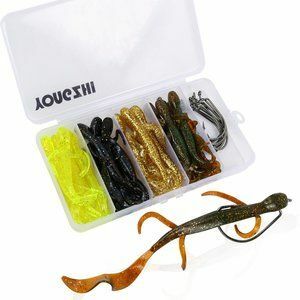 These lures are especially suitable for catching smallmouth bass in the winter or early spring. This time of the year in many areas of the U.S. the water is around 40-degrees Fahrenheit which is the ideal temperature for casting jigs. This lure is effective around rocky angled banks that have submerged tree stumps. 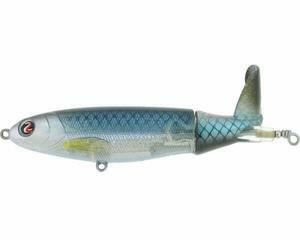 The casting jig imitates baitfish like the crawfish, and you can cast it to different depths depending on the area your fishing in. When fishing with jerk baits, you are going to want the water to be clear. The bass is attracted to the sight of this type lure in it’s jerking motion. They are also invited to the noise that it makes. With the jerk bait, you want to yank your fishing rod around to get that jerky look that that bass love. You will want to cast it far out there and work the lure keeping slack in the line. Deep suspending jerk baits work best for deeper water that you can’t see because they won’t roll like your normal jerk bait. The flashiness and the sound of the deep suspending jerk bait will grab the basses attention and hold it until they strike. I recommend having both types of jerk bait with me depending on the situation I run into. 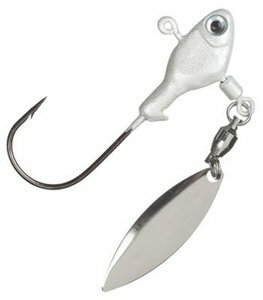 Next on the list of top 10 bass fishing lures is the tail spinner. I never leave home without it, for bass fishing that is. The key to catching bass with a tail spinner is to do a hard fast draw and just let the lure spin for a few seconds. The bass loves the shine of the spinner as it glides through the water. You will want to be fishing close to the bottom with a tail spinner. It goes to the bottom and spins just above the basses head. Using what they call flutter spoons you want at least a seven-foot rod. These lures are heavy pieces of metal forged into the shape of a spoon like its name they flutter and drop slowly into the water. The rod you use will make all the difference in the presentation of the spoon. Like I said recommended rod length of 7 to a 7.8, and the rod should be a medium to heavyweight. This way you can get the lure to where you want it and be able to work it effectively. The spoon is a great lure to catch that big 5-pound to 10-pound bass. It also works best when the bass are active in schools going after shad. Number 5 of the top 10 bass fishing lures is the plain old grub. These work well in the colder water that’s below 40 degrees Fahrenheit. They work best in this temperature of water because of the shine the grub gives off. You will want to use a light line when fishing with a grub so that it doesn’t rise in the water. A lite line also keeps it running steadily through the water. To effectively fish with a grub you need to cast it out and let it slowly sink to the bottom. Then just lightly jig it around reeling slowly. You don’t want to do these big jerking motions like a lot of anglers do that don’t know any better. The blade bait sounds like a something out of a horror film lol. 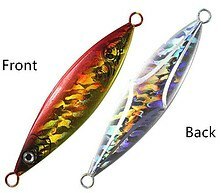 These blade lures are used best in rugged environments like the staircase rock structures along the river banks where bass love to hide in the pockets of the stairs. The water doesn’t have to be deep either. Anywhere from 10 feet to 3 feet of water, you can catch bass with a blade bait. To fish blade baits you want to do short pitches like pitching a jig. Gently hopping of the bottom around cover like dock pilings or sloped shorelines work best with the blade bait. This works exceptionally well in colder water around the end of fall or early winter. Under spinners are spinner baits that have the spinner spoons underneath artificial bait. These are used best fishing down in deep water along and off the bottom. With under spinners you just cast the lure reel it in slowly keeping the lure right over the basses head. They are attracted to the glimmer of the spinners and the vibration the bait gives off. On to number 8 in the top 10 bass fishing lures list is the crankbait. Crankbaits come in all shapes, sizes, and weights. These lures can be fished in open water and dense foliage. Crankbaits can be used in different depths of water, but the thing is you have to get the right crankbait for the depth of water you are fishing. If you want to use crankbaits, I recommend carrying quite a few different kinds with you. The casting and fishing with crankbaits are straightforward. You just cast and retrieve slowly giving it a little tug now and again which might get the bass to strike at it. 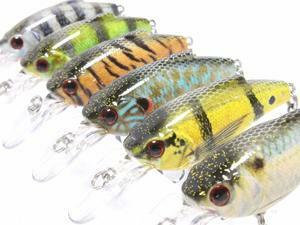 You will also want to keep various colors in your crankbait stash. Experimentation is critical when being successful at fishing with crankbaits. With the swimbaits, you have to have a swimbait hook. The swimbait is attached to the top of the hook with what’s called a hitchhiker. You essentially twist the swimbait onto the hitchhiker leaving a little of the hitchhiker showing. Then you hook the middle of the swimbait with the hook and cast it. Very straightforward on how to fish a swimbait. You just cast it out and swim it back in. Swimbaits can be used on top of the water or below. Running it on top of the water would be for grassy areas or lily pads because it floats over the lily pads and then sinks once you get past them. When fishing below water, you are usually fishing in the open water along the grass line. Last but not least in our top 10 bass fishing lures is the buzzbait. These lures are much like spinner baits, but they have a bent wire which is set on top of a jig head. It gets the name from the buzzing effect it gives off as it swims on top of the water. 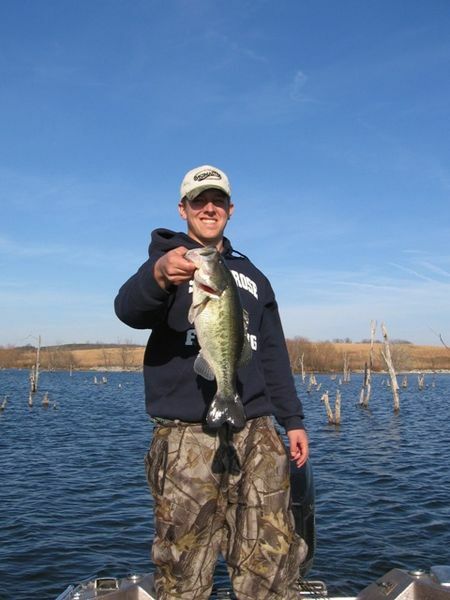 Buzzbaits work best for big bass that are swimming close to the top of the water. The largemouth bass will jump at a buzzbait like nobodies busy. Easy to maneuver. Just cast it out and slowly reel it back in giving it a jerk once in a while. Buzzbaits work great in clear water as well through grass, lily pads and over dead underwater branches. The best time to fish a buzzbait or any topwater lures is during the fall or right after spawning season. Well, that is the list of my top 10 bass fishing lures. I hope you enjoyed the article and got some useful information from it. If you don’t have some of these lures in your tackle box, I recommend you go out and buy them. You will catch a ton of big bass using these ten types of lures. If you have any questions or comments feel free to leave them in the comments section below. To contact me directly you can send me an email cory@tackleboxtalk.com I would be glad to hear from ya. P.S. If you’re interested in learning how to make money selling fishing tackle online I wrote an article on the subject. Click here to check out the article. Thanks again and Happy fishing! Looking for a Spinning Reel that has everything you want in Features and Technology? But won’t tear your wallet in two? If you said yes then you have landed on the right website. Today I’m reviewing the 13 Fishing spinning reels Creed series. There are three in the series that I will be comparing today. We have the Creed K, Creed X, and Creed GT. I will be comparing these reels in that order. So, hang on to your hats and let’s get started. The higher the model number you go, the bigger the fish you are going to be able to catch with the reel. This reel is easy on the wallet under $50. It has precision components with an oversized bail and aluminum handle which keeps it from rusting plus makes it lighter and easier to cast. The Creed K has soft touch knobs that make it comfortable when casting and reeling for long periods. A soft touch knob provides for a good grip so that rod and reel don’t go flying out of your grasp when you are tackling a monster fish that doesn’t want to get into the boat or out of the ice. With this Creed series reel, you get a six-disc drag that puts out eight to eleven pounds of pull. The first two models the 1000 and 2000 give you 8 pounds of drag, and the 3000 and 4000 models put out 11 pounds of drag. With the six-disc drag, it will ensure to keep your fishing line from snapping with those bigger fish you might encounter. There is very little movement with the Creed K reel because of its one-piece aluminum handle. All in all, it’s a good reel for the price so if your budgets tight and you want a reel that won’t fall apart at the first cast go with the Creed K.
The second in the creed series is the Creed X. This reel is one step up from the Creed K. The difference from the K series is that it has an airfoil carbon frame. The airfoil carbon makes the frame of the reel strong but lightweight. The gear feeling is better because of the rigidity increase which allows for a more smooth drive train alignment. The X comes in four models 1000,2000,3000,4000. The difference in models is the line capacity, weight of the reel and the maximum drag it has. Another awesome reel for the price only $20 more than the Creed K at only $69.99. Pick up the Creed X today you won’t regret it. Last on our list of 13 Fishing spinning reels series is the Creed GT. This is hands down the best reel in the bunch. It feels just like your fishing with a $200 reel, but with this reel, you truly get the best bang for your buck. The GT only costs $89.99 retail. For what you get that’s a fantastic price. This one has everything the other two have plus a CNC flatline management system which allows backing knots to sit flush in the spool for better managing of your line. An airfoil carbon rotor for more strength and an airfoil carbon handle which helps in the reduction of the weight of the reel. There are four models in the Creed GT series reel. The Creed GT spinning reel is the top of the line in the Creed series. 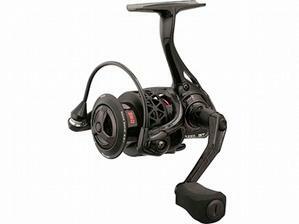 If you want high performance, precision engineering, and a smooth reeling lighter weight reel? Then you will want to go with the Creed GT series by 13 Fishing. 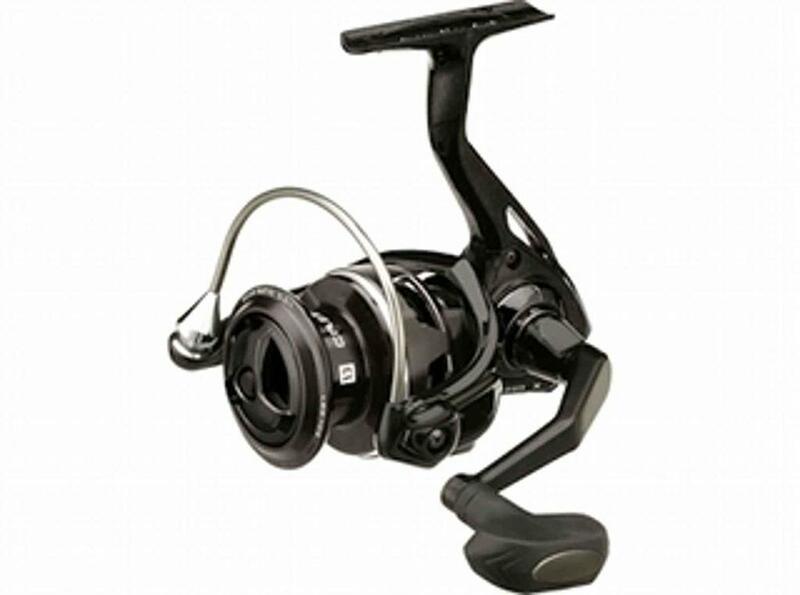 13 Fishing has some great reels with up to date technology, precision components and almost just as important price. Their prices are low, but their quality of the product is superb. No need to break the bank take a look around at other brands of reels and compare them to 13 Fishing spinning reels. I bet you will come back and purchase the 13 Fishing brand over its competitors any day. Once you have your fishing reel all lined up, you will want to do a little digging into the rod you want to attack your reel too. You can check out our article on Ian Miller fishing rods which are some of the unique quality rods on the planet. You can click here to check them out. They are sweet! 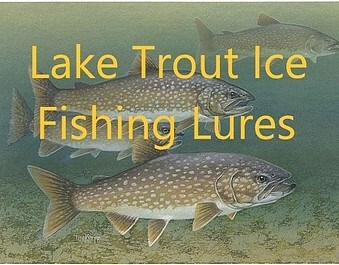 So you’re looking for lake trout ice fishing lures? Lake Trout or lakers as they are called in the angling world are different when it comes to cold temperatures than fish like panfish, bass, perch, and walleye. 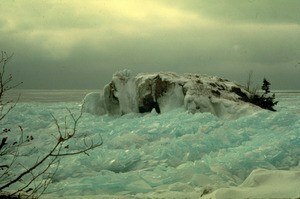 Lake Trout thrive when the ice starts forming. They like it when the water is around 30 to 40 degrees Fahrenheit compared to when it is 60 to 70 degrees Fahrenheit. Trout basically will eat anything that’s around them at the time. They are tough fish, and they taste oh so good as well. They can be hard to find under ice so you will want to pack some patience before heading out to ice fish for lakers. You will want to plan on drilling two holes in the ice side by side because these fish like to fight and if you don’t do this, you will end up losing that fight when the fish gets bumped up under the ice near the hole tearing the bait out and swimming away. That can be the most frustrating thing ever so make sure to drill two holes making them into one. It will end up being a 16″ to 20″ huge hole depending on the size blade you have for your auger. areas during the ice fishing season which can be under 10 feet deep. Compared to other fish that tend to move deeper in the colder weather. But they can go as deep as they want it all depends on where the food is at. Lake trout can grow to 60 pounds or more and enjoy feeding on other fish species like salmon, ciscoes and whitefish. They are cannibals as well as eating their very own kind! They are free to roam pretty much anywhere they wish in the hard water season. You will find them around deep basins of water with submerged undergrowth such as reefs, dead trees, and islands. You will see them in areas where big schools of fish hangout such as the areas I mentioned earlier. They like to herd their prey around bends and inside turns making it easier to feed on them. Now that you have an idea of where to find lake trout in the winter and what they consume I will get into answering what kinds of lake trout ice fishing lures and live bait to use. Lake trout love the live bait when they are in an inactive state. Trout usually takes them closer to the bottom of the lake. The following is some live baits lakers go after. Trout are hungry creatures in winter, and they primarily go for the smell of live bait when they are inactive. But they will go after either live or shiny colored bait if they are active or inactive. They will tend to go after smell more when their dormant and the visual look of an artificial lure when they are busy. You will have to experiment like any other fish that you are fishing for in the winter. Nightcrawlers would be my first choice because they are easy to transport to the ice. You will need to keep them from freezing solid like any other live bait that you use. Just keep them in an insulated bucket should do the trick. 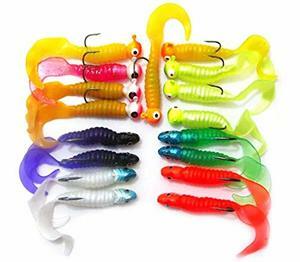 You can just put the night crawlers on a regular fishing hook and use 1 to 2-ounce sinkers and drop your line so that it goes close to the bottom of the lake. This technique works for the inactive lakers. The active lakers are another story, and I will explain that a little farther down in the article. With minnows, you can either throw them on a hook and add your sinkers about 1 to 2 ounces. Or you can add a spinner to the mix and catch them by the smell of the bait and by the flashy look of the bait. Using a bright colored spinner bait would be your best option. Either way, lakers go crazy after minnows in the winter time. You can also use Wax Worms or waxies when fishing for lake trout in the winter. You need to couple them with a jig, and this will jump-start the lakers into a feeding frenzy! Now that we have discussed what live bait to use I’m going to explain the best lake trout ice fishing lures to use. You will want to find lures that mimic the types of fish that are part of their diet naturally like the ciscoes and salmon. When they are presented to the trout, the best kinds of lures will mimic a struggling or dying fish. They will typically go after those kinds of artificial bait because that’s what they would go after if it was a real live fish. Colors that are used would be the natural colors of their prey which would be silver and white, maybe a little pearl color mixed in. When you’re, fishing them in shallow water, I will use a jig with a 4-inch long curly tail hooked on it. Ice fishing with spoons can be tricky but rewarding if you present it rights. You will want to let the spoon drop then give it a quick jerk. Reel it in about half-way up and then let it pause for a second then dropping it back down. You can also use live bait hooked to the spoon to give it that live smell those lakers are craving for. When the spoon wiggles downward it looks like a dying baitfish in free fall. Lake trout are going after tubes in the cold months. They especially like the white tubes. Don’t ask me why but I’ve heard many ice anglers of late saying they are getting hits on these white tubes. Tubes come in many shades of color. So I would get a pack and try various colored ones out and see which color they like to but on best in your area. The next lure we have in the bucket is the crankbait. 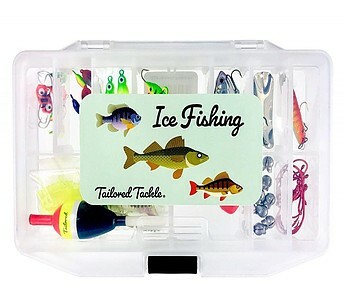 One of the most widely used ice fishing lures by avid ice anglers. 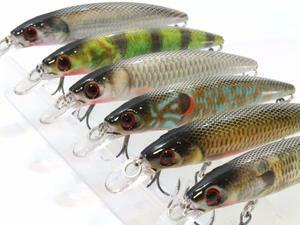 There are many kinds of crankbaits that you can purchase. Crankbaits usually mimic the lakers prey in the way that it bobs up and down and swims through the water. These are known for their rattle noise when going down and when coming up. Crankbaits attracts the fish, and they come to you instead of you going to them. The paint jobs on crankbaits vary wildly, but the main attraction is the rattling sound they make. They do have crankbaits that are more like three baits in one. Making it look like a school of fish, and we know trout love to go after schools of fish especially in the winter time. Try these crankbaits out next time you hit the ice. 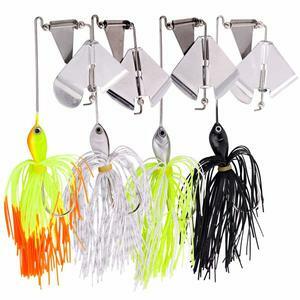 Lastly, we have spinner jigs. 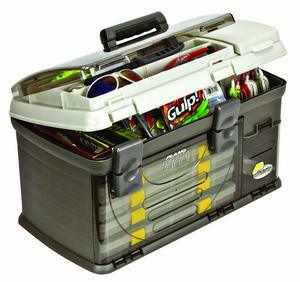 One of the most widely used ice fishing lures by avid ice anglers is the jig. And the jig works exceptionally well for hard water trout fishing. All you have to do is pick your color and kinds of jig you want, tie it to your line and your off and jigging. 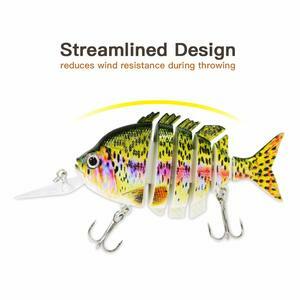 Spinner jigs work well because of their shiny design and vibration effect in the hard cold water. 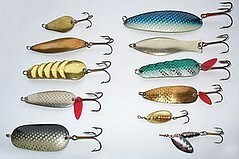 Now that I have given you some options on what kinds of lake trout ice fishing lures that are out there. I will the type of fishing line you will want to use and rod length. For fishing lakers, you want to go with about 10lb test fishing line in fluorocarbon or monofilament. With these lines, you can get a more significant radial drop which is nice to have with the artificial lures you are using. You will want a stiff rod about 40 inches long with a little action in the tip. Well, now you have all the information you need on lake trout ice fishing lures and how to use them effectively. It is time for you to get out there and try these lures and techniques out for yourself. Like any other kinds of fish when it comes to there eating habits. It all depends on the lake, what time of day, the temperature of the water, if it’s cloudy or sunny, lots of snowpacks, minimal snowpacks. You just have to experiment with colors, sounds, movements, and smell. So good luck in your ice fishing for trout efforts and I hope you pull in that big one! If you have any questions, comments or a trout fishing story you would like to share, please leave them in the comments section below or email me: cory@tackleboxtalk.com I would love to hear from you! The winter season is one of my favorite times of the year to go fishing. The routine of packing all my fishing gear up and heading to the lake relaxes me. One of my favorite fish to catch is the crappie, and my favorite way to catch them is with ice fishing crappie jigs. Crappies are usually just a little bigger than panfish, and they taste oh so good. Just gut’em scale’em and throw ’em in the frying pan! I love catching my limit of these suckers every chance I get. Why Jig For Crappie In The Winter? In the winter the crappies tend to congregate together. This makes them much easier to catch than in the summer fishing season. Also in the winter, the crappies like to stay on the bottom of the lake and in the weeds like a bass. There are many ways to catch crappies but when ice fishing for crappies it’s best to go with jigging. That’s because of the crappies being on the bottom of the lake where jigging is most effective. Jigging is the most popular method of catching crappies through the ice. This is because you can’t cast when ice fishing unless you are incredibly talented. 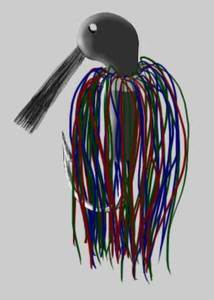 When you vertical jig you essentially raise your pole up and down repeatedly pausing then letting it drop down. This makes the fish think that it’s live bait that’s swimming naturally in the water. 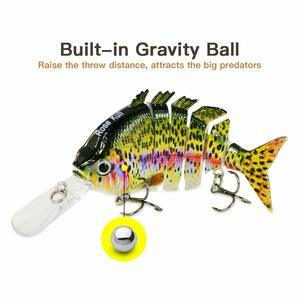 Just drop your jig close to the bottom trying not to go all the way to the bottom because this could stir up the sediment causing the crappies to scatter. You don’t want that to happen. You want them to all stay in a school. Keep jigging it up and down pausing in between until you snag one. When I ice fish with jigs using the vertical method I use an ice fishing pole without a reel. You can jig through the ice with a reel attached, but it’s not needed for this method of fishing. Ice Fishing Crappie Jigs – What To Look For? 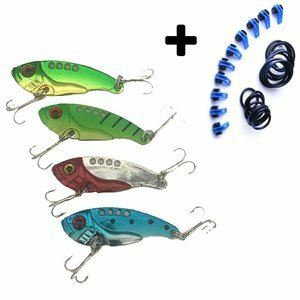 ==> The size of the jigs should be quite small. Bigger jigs will hinder your activity a little bit. The size I prefer using is in the 1/64 to 1/16 oz. range. The crappies metabolism slows down in the winter months. As a result, the crappies slow down as well. The crappies will be attracted to the smaller jigs, and they will tend to strike faster and easier. By using the smaller jigs the crappies won’t get so riled up so easily. This keeps the crappies grouped in a school so that you don’t have to drill more holes looking for the fish. ==> The colors of the jig is even more important than the size. It all depends on a few factors of what colors of ice fishing crappie jigs to use. If you’re fishing in deep water, you are going to want to with brighter color ice fishing crappie jigs that glow. A metallic finished jig could work as well. It gives that glimpse of shine the crappies like to see. The deeper you go, the brighter the colors should be. 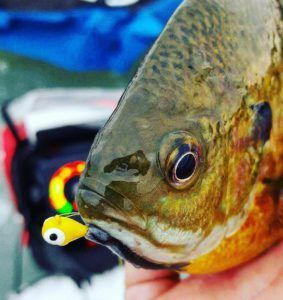 So when using ice fishing crappie jigs, you probably want to go with the brighter colored jigs because you are fishing more towards the bottom of the lake. The bottom is where the water is darkest. 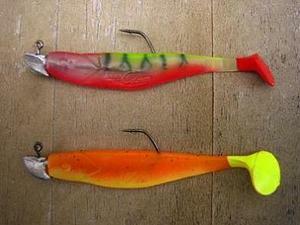 If the ice is thick, you want to use the brighter colored jigs. If the ice is thin, go with the more dull colors. Also, how much snow is on the ice will make a difference. If there’s a lot of snow on the ice go with brighter colors. If not much snow or clear ice go with the dull colors. 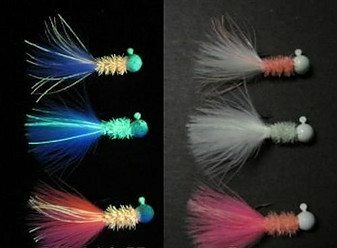 That gives you an idea of what colors of jigs to use and under what conditions to use them. You use bright colors for dark situations and dark colors for light situations. This is not set in stone. Some days the fish might contradict the norm. Just experiment and try different colors with certain situations and you will find the right color jig you’re looking for. I put together a list of ice fishing crappie jigs I like to use when I’m out ice fishing. There are five different major brands that catch those crappies in a snap. 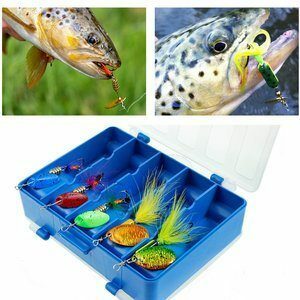 Tailored Tackle has a 75pcs starter kit with an assortment of ice fishing lures and jigs. 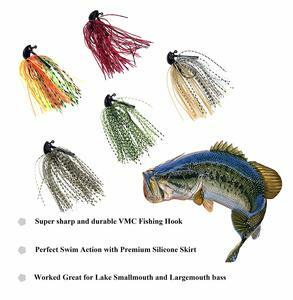 Various colors and sizes come in this package — another great pack of ice fishing crappie jigs for the beginner. 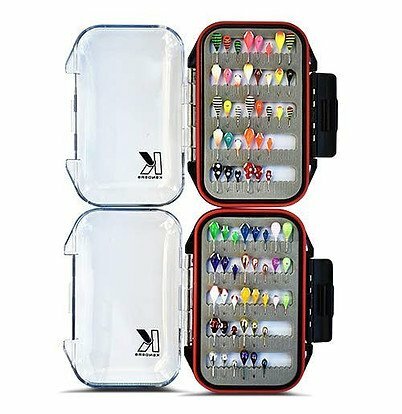 This Kenders Outdoors kit comes with a vast assortment of ice fishing jigs 75pcs and a waterproof carrying case to boot. Pick this one up if your ready to do some serious crappie fishing! 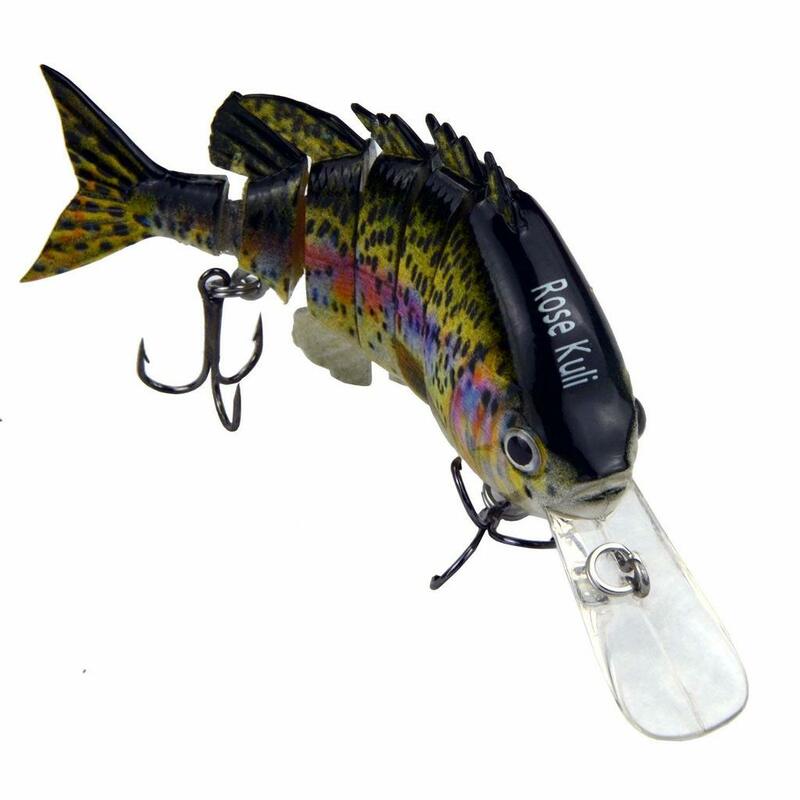 Ice fishing crappie jigs are numerous in size and diverse in colors and variations of colors. There is a lot to choose from. In the end, you have to try different ones out with varying situations of ice fishing to find the right fight for you. Every new day ice fishing for crappie with jigs can be a challenge, but to me, that’s the fun of it. Now, take what you have learned today and get out there and catch your limit of crappies. See ya on the ice! If you have a question or comment on this article or anything fishing leave them in the comments below. You can email me directly cory@tackleboxtalk.com Thanks, and remember… You can Catch Your Fish And Eat’em 2. Happy Fishing All!